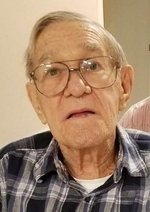 Herbert Burton Lawson, 89, of Salem, Va. passed away on Monday, November 5, 2018. Herbert was born in Boissevain, Va., on Monday, March 11, 1929. He retired from the Roanoke County School Board, where he was a lifelong mechanic. Herbert is preceded in death by his parents, Mose and Lillian Lawson; his first wife, Kathleen Lawson; second wife, Ollie Lawson; son, Kenny Lawson; sisters, Rachel, Eva, Betty Jean, and Dorothy; brothers William, James, Cecil, Alfred, and Orma. Herbert is survived by his son, Jeff Lawson and wife, Crystal; daughter-in-law, Pat Lawson; grandchildren, Lindsay, Chris and wife, Emily, Kasey, Tyler and wife, Melissa, and Abriana; his sister Lillian Harmon; and numerous nieces and nephews. A funeral service will be conducted at 11 a.m. on Thursday, November 8, 2018 at the John M. Oakey & Son Funeral Home in Salem, Va. with Marshall Allen officiating. Burial will follow at Sherwood Memorial Park in Salem, Va.
Friends may visit with the family at the funeral home on Thursday from 10 a.m. until the service hour. His family would like to thank South Roanoke Nursing Home, Carilion Hospice, and Salem Terrace for providing Herbert with excellent care over the last several years.